So... this is a thing. The dates aren't until next year. I know! I suppose I could have toured this year but only with material from the new TV series and I don't think it's on to charge money for tickets to see something you can see free on the box. A tour should contain new stuff. So, with a few other commitments to look out for, 2014 it is. I've already been answering questions on Twitter so I hope it won't seem presumptuous to try and head a couple off at the pass. 1: I don't book venues, they book me. If I'm not playing near you, it's not because I chose to avoid you! 2: That said, there were a couple of venues that wanted the show, but they also wanted to charge the public extortionate booking fees, so I passed. 3: If you can see a venue on the list but it's not showing up on the See Tickets link, check back in an hour or two... I think some of the venue's box offices are taking a bit longer than planned to make the arrangements with See. So episode two of the series airs tonight... and there's something in the show that illustrates a point I've been wanting to make for a while about how we made it that answers some of the questions I've been asked a lot in the last week. If you've read a previous blog about my last tour you'll know that what I do - which involves a lot of found media (screen grabs from websites, magazines, newspapers etc etc) - creates a legal challenge when it comes to filming things. A few people have asked me why we've been able to include certain material in the show given that it would have been impossible to put it in a DVD. Anyway... I think it's worth saying that the channel (and the production company) have been brilliantly robust about these kind of issues and taken a far more common-sense approach than I've experienced in the past elsewhere. One of the things that is often frustrating with TV is the idea that they have a process that can be applied to other things. When a comic builds a live show, they do it by going out and trying out material in front of real audiences. People try out new ideas in low(er) pressure gigs where the audience knows that that's the deal. They do preview shows in smaller venues and at cheaper ticket prices while they hone stuff. And all being well, by the time they're on tour with their name above the door so to speak, the show all works. Because it's been engineered that way. Too often there is an attitude in TV that they can replace that honing process with a series of meetings. That having a round table script discussion with producers and lawyers will help to hone material in the same way that performing it to an audience will. It's nonsensical to me. I like collaborating, I'm not arguing that they should cede everything to control-freak performers, just that micro-managing the details by committee isn't a very helpful way to work. Not for me, anyway. It's why with this series we did a load of live previews before the recordings. We were trying to do our editing before the taping, not afterwards. I always dislike watching shows that feel like they were made in the edit suite. It meant that we never had a paper script for the show... I don't want to learn a script, I want to see how the words fall out the first time I try to express the idea in front of an audience and then try again tomorrow if it falls out wrong. I find learning a script impedes the part of the brain that is meant to be engaging with the idea and it starts to sound like a recording. Lawyer: What exactly are you going to say? Me: I don't know yet. But tell me what exactly I can't say? Lawyer: It doesn't work like that. But we got through it. The material in tonight's episode was previewed in Fareham and in Windsor. So if you came to one of those shows, you saw a rough version of most of what's in the show. Apart from one bit. One teeny, weeny... but hugely significant bit. There's one thing in tonight's show which I couldn't discuss on stage in Fareham and in Windsor because it hadn't happened yet. Or at least it hadn't played out. I was keeping a secret from the production team... who thought they were keeping a secret from me. The truth only came out about an hour before the recording. It couldn't have panned out the way it did if we'd had lawyers demanding scripts in advance. Weirdly, it's the fact that they accepted the idea of honing the stuff live - and without a paper trail of words for them to stay on top of - that meant tonight's show was able to contain the surprise it does. I've tried to be oblique and spoiler free... but I hope you can catch the show. 10pm. Tonight. On Dave. Apologies that what follows is a blog post about some boring admin... but I've received a few emails and tweets from people who are concerned that they signed up to the mailing list and haven't yet received an email... and I find it easier to post an explanation here and then point people at it than to try and explain all this in a series of individual replies. If it doesn't apply to you... feel free to move along! An email was sent out in the early hours of Monday morning so if you're on my mailing list you should have one. If you're on the list and one appears not to have arrived, the first thing I'd recommend would be to check your junk folder. There are about 11,000 people on the mailing list and some servers assume that any email sent to that many people must be spam and treat it accordingly.If it is in your junk folder, I'd suggest putting the domain on a safe list - so that it doesn't get treated as junk in future. The double opt in is my way of guaranteeing I can't be accused of sending spam. Only people who get the email and click on the link will then get the mail outs. If at any time you want to unsubscribe, you can just as easily do so in the same way. I can see that in the last week for example, 150 people have tried to subscribe but then not clicked on the link to confirm it. Of course this might be because they decided against it by the time the email came through, or because they entered an incorrect address in the first place or - more likely - it's because the double-opt-in email has been sent to their junk folder and so they simply don't realise that the email has turned up. I can only send the emails out. I can't do much to influence whether or not your email server recognises it as legit... but you can. 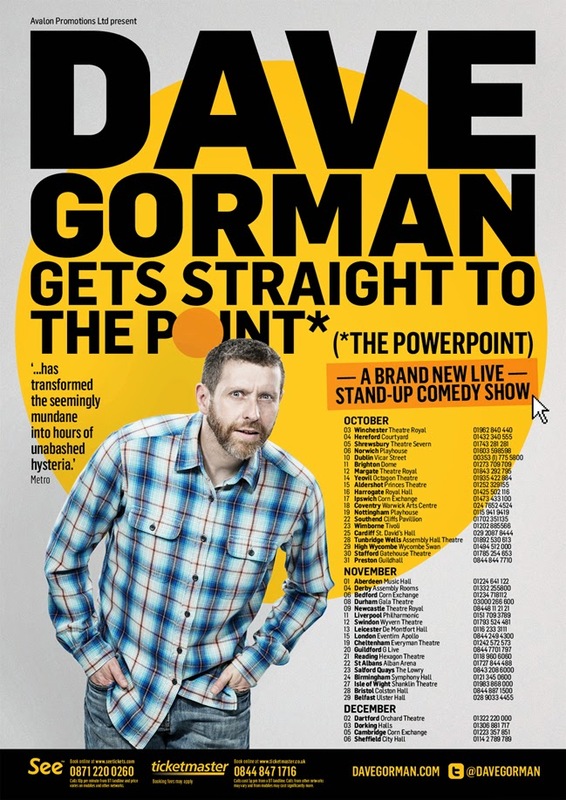 If you're on the list but you haven't received the email... then take a look in the junk folder and try adding the domain davegorman.com to a safe list. I promise, I never spam. That said... if you do want to buy some printer ink get in touch, maybe I can do you a deal. 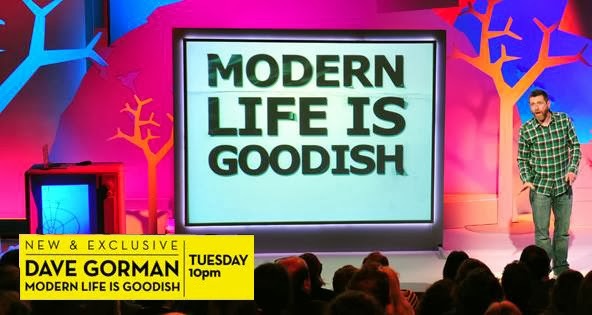 Oh... and, as well as asking a question about the show as a way of running a Gorscreen competition... the email was also a reminder that episode two of Modern Life Is Goodish goes out tomorrow - Tuesday - at 10pm. So, y'know... there's that. So, the series launched last night and I've been completely blown away by how positive the reaction has been. Thanks everyone. If you didn't catch the show and want to, there's a repeat at 10.40 tonight (Wednesday) and another on Saturday night at 11. And I think it can be viewed on demand on the Dave website for a few days too. 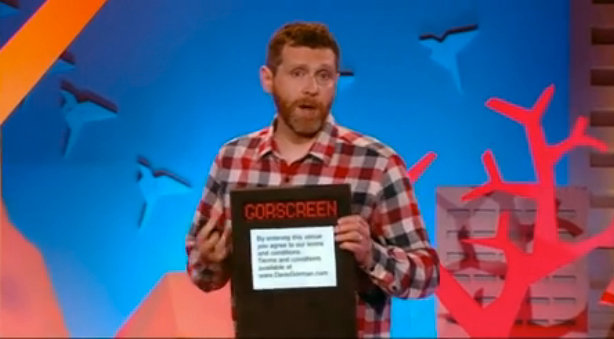 If you haven't seen it, I don't think there's anything that will be spoiled by showing you this picture from the show, featuring the, er... GORSCREEN. 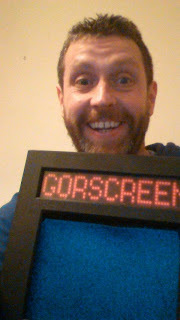 I mentioned on Twitter last night that the props department had given me the GORSCREEN frame after the show and that I might give it away in a competition if people were interested... and some people do seem to be. So I guess I ought to work out a way of doing so. Sometimes when I see someone running a competition on Twitter (RT this/use this hashtag/that sort of thing) I think it can be a way of encouraging people to spam their followers by filling their timeline with things and I definitely don't want to do that. Nor do I want to do anything that people might mistake for that. And besides, I don't want to exclude people who might follow me on facebook but not on Twitter... or for that matter anyone who does neither of the above. I also have to think of a way of actually picking a winner. So what I've arrived at is this: a competition for members of my mailing list. On Monday, I'll email my mailing list a question about episode two in the series. To enter the competition, you have to be on my mailing list. I don't want that to put people off. I promise I don't send out loads of emails. I only really use it to let people know when I've got new things happening and I don't store the addresses on my own computer or anything like that. Realistically, I'd rather a prop from the show went to someone who was interested in what I'm doing next than someone who just saw a retweet from their mate one afternoon and sent a reply. That said, it's easy to join and just as easy to leave too. I won't even know you've done it. You can subscribe - or unsubscribe - on this page of my website. Only one entry per person. Let's not be silly. If you think you've signed up to the mailing list but the email with the question doesn't turn up... I can't be held responsible for it. I will send the email. Check your spam folder. Did you confirm your subscription? etc etc etc. If an email address bounces back to the list a few times it can end up being deleted from the list also. I really am hugely chuffed by the response to the show, and I hope people will enjoy the other five shows too. If there are other props, objects, souvenirs or what have you that I can think of from those shows... maybe I'll do this again with other, um, prizes. Big thanks to everyone who tweeted, facebooked and emailed kind words. You're lovely you are. ... it's a brag brag. I don't really understand the idea that you'd make a show and then not want people to watch it or coolly not mention it and just hope that people find out about it somehow. 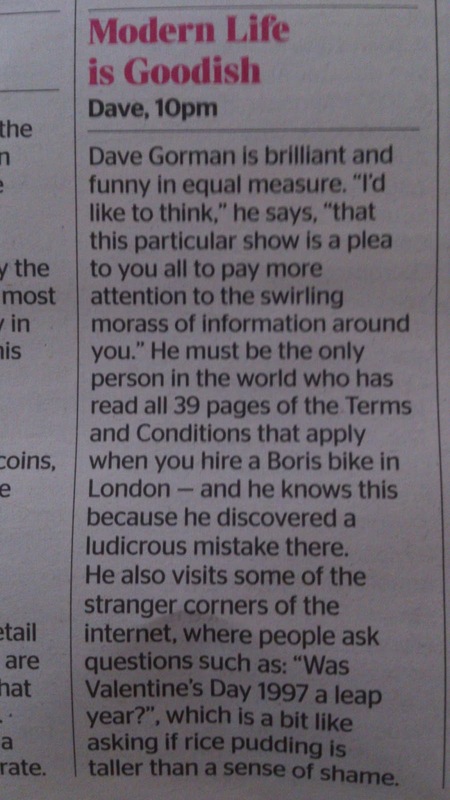 This was in The Times yesterday... on Tuesday's TV page. I expect the first line will be used as a pull quote. That said, it occurs to me that you could have those two qualities in equal measure by having none of either as well, but I don't think that's what he means. At least I hope it isn't. Have I mentioned the show's on Dave at 10pm on Tuesday?